On Aug. 8, the U.S. Department of Veterans Affairs released the Spanish version of the application for health benefits, as part of VA’s effort to simplify and improve the health care enrollment process for veterans. The new language version implements the VA Advisory Committee on Minority Veterans’ recommendation to provide Spanish versions of the application and instructions. According to the National Center for Veterans Analysis and Statistics, the number of living veterans who identify as being Hispanic or Latino, as of Sept. 30, 2017, is nearly 1.5 million people. More than half a million veterans already enrolled in the VA health care system self-identify as Hispanic or Latino. 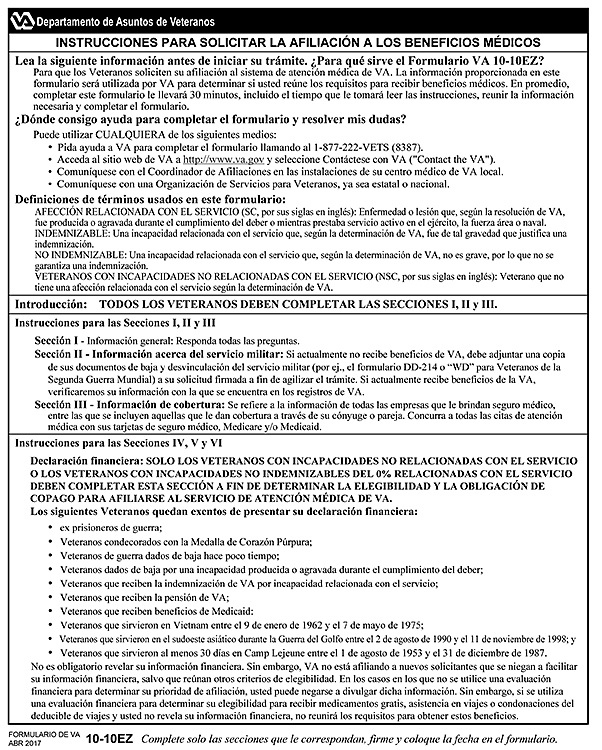 The form is available at VA medical facilities and online at https://www.va.gov/vaforms/medical/pdf/10-10EZ_Spanish.pdf. Veterans can apply for VA health care benefits online at https://www.vets.gov/health-care/apply/; by telephone at 877-222-VETS (877-222-8387) between 8 a.m. and 8 p.m., EST, Monday through Friday; at a VA health care facility; or by completing a hard copy of the form and mailing it to Health Eligibility Center, 2957 Clairmont Road, Suite 200, Atlanta, GA 30329.